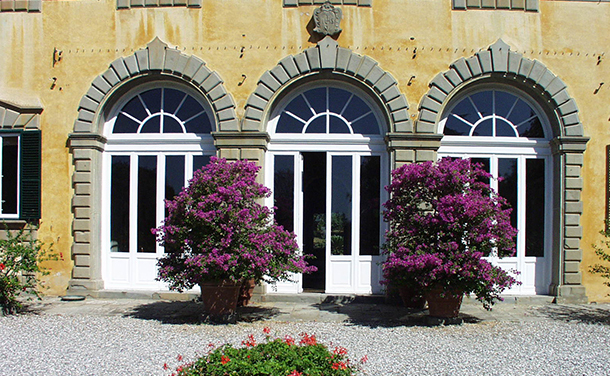 In the village of Marlia, about 8 km from Lucca, you will find some of the most beautiful villas of the 16th century, famous not only for their elegant architecture, but also for the gardens and grounds that surround them. Of these villas Villa Diodati is perhaps one of the most interesting. The architecture of the villa was completely transformed in the 1700s, and you can still admire the frescoes on the walls and on the ceilings, and in particular the beautiful vaulted stairs that lead to the upper floors. Villa Diodati, when it is not being rented, is often lived-in by the current owner, so it has preserved the pleasant feeling that it is still inhabited, both from the furnishings, with its elegant and precious antique furniture and also from the details: family pictures and objects. The villa lies on three floors, the ground floor that comprises all the rooms used during the day, with several salons that look onto the garden, while the upper floors are dedicated to the sleeping areas. All around the villa is a private area of about three hectares, with a marvellous Italian garden next to the villa, a separate area that holds the private swimming-pool ( 7x14m), the tennis court, a spacious outbuilding where ceremonies and meetings can be organised, a little wood with ancient trees and a small vineyard. The two annexes are in a typical L-shaped building close to the villa and are used when there are more than 14 people in the party. The villa is equipped with telephone, satellite TV and a stereo/CD, AC in the bedrooms of the main villa. The following is included in the cost of the rental: a daily cleaning service, breakfast, preparation of lunch or dinner (your choice) with waiting service at table, bath-linen is changed daily and bed-linen is changed twice a week, and there is a weekly laundry service. Florence is about 80 km away, Pisa airport about 30 km and the sea at Versilia about 25 km. (Dependance 2) FIRST FLOOR: entrance, kitchen, living-room with dining-area and fireplace, 1 double bedroom, 1 twin bedroom, 1 single bedroom, 1 bathroom with tub. Paid with the rental fee: Costs for service personnel for daily cleaning, preparation of breakfast and dinner for up to 14 guests: 2 service staff for a total of 16 hours a day plus cook service for 4 hours; for up to 18 guests: 3 service staff for a total of 20 hours a day plus cook service for 5 hours; for up to 22 guests: 3 service staff for a total of 24 hours a day plus cook service for 6 hours. Meals are served at the following times: breakfast (09.00 – 10.30), lunch (12.30 -14.00), dinner (20.00 – 21.30). For food provisions a minimum deposit of Euro 500.00 is requested on arrival. Paid on site in cash: - further hours of domestic service over and above what is included: €10 per hour; - external laundry service once a week: according to cost; - bed- and bath- linen, over and above what is included: €8 per person; - telephone: according to use. Bed and bath linen: 2 sets of bed and bath linen per week included in the price.